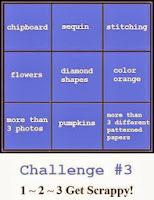 I guess the title of this post is a little misleading; I haven't combined the challenges as much as completed each one separately but on the same subject which is why I am going to load them together. First: Scrap friends; I really enjoy these sketches as they push me to work out of my comfort zone. The sketches often ask for multi-layering and that is something I struggle with. This is our third grandson and many regular visitors will know the trials and tribulations he has been through. These photos were taken at a family gathering for my MIL's 80th birthday but we used it as an opportunity to give our grandson his 4th birthday presents as he would be celebrating mid-week. As soon as the gifts came out he was surrounded by his cousins so that they could see what he had received. It was a magical moment as we do not often get the opportunity to be together as a family. Here is my page for Scrap Friends. Magic 4. 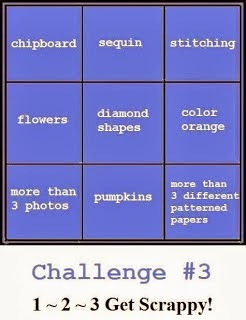 123 Get Scrappy is an interesting challenge site as it allows you to choose elements of the challenge; for example I have chosen 3 left to right diagonally: Chipboard; the title, Diamond Shapes, More than three different pattern papers. We have a tradition in our family; Christmas and birthdays you get a book, DVD or CD, some clothes and a toy or game. All the children know that it is what we give and there are no favourites, no-one gets more than another; here our grandson is opening the card after looking at the book we gave him; it was a Graeme Base book and had some incredible art work in it. The excitement was building as we had already opened and set aside the clothes; that meant the toy was last! Here is my page for 123 GS. Growing Up. And finally Sketchabilities; another challenge that pushes me to do more than the norm. We gave our Grandson Lego but as we were at a function he was not able to undo the package and build it then. The man in the photo helping him to build his toy is not his Dad; he died 6 months before this little fellow was born; this is the man who will help our daughter-in-law guide her little boy through life. This man is now her fiancé; a widower with two children of his own that she will help guide through their lives too. We received these photos by text later the same evening; two thumbs up for a job well done. This is a Magic Moment. 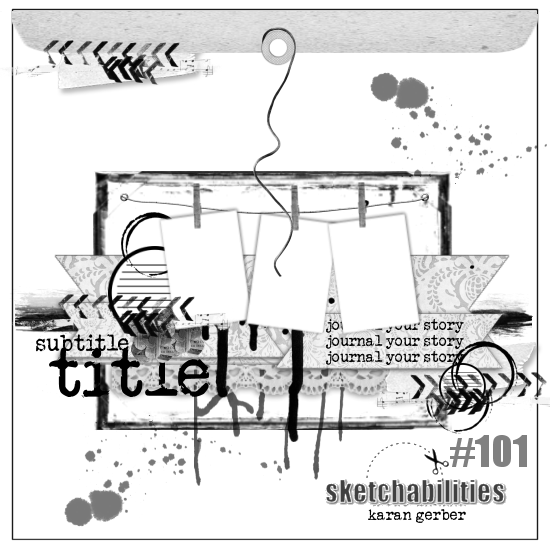 Sketch abilities....love the stitching, love the washi tape, love the photos, what's not to love?! Great pages Susan, gorgeous photos and I love how you put your own spin on the sketches! 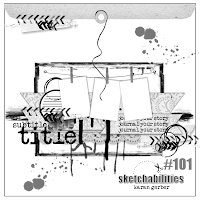 You obviously scrap to tell special stories Susan and I love your take on the Sketchabilities sketch - all the little details looks great! I really like ALL of these ! 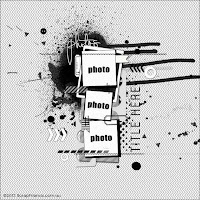 And good on you for getting those layers going with the sketches, too:):) LOOOOVE the one you did for us at Scrap Friends - those big chevrons & the background masking? DELICIOUS!!!! All the LOs are fabulous! Thanks for joining us @123 GetScrappy. Gorgeous pages! Great job with the sketchabilities sketch! Thank you so much for playing along! What great pages! So glad you could join us over at 123 Get Scrappy! 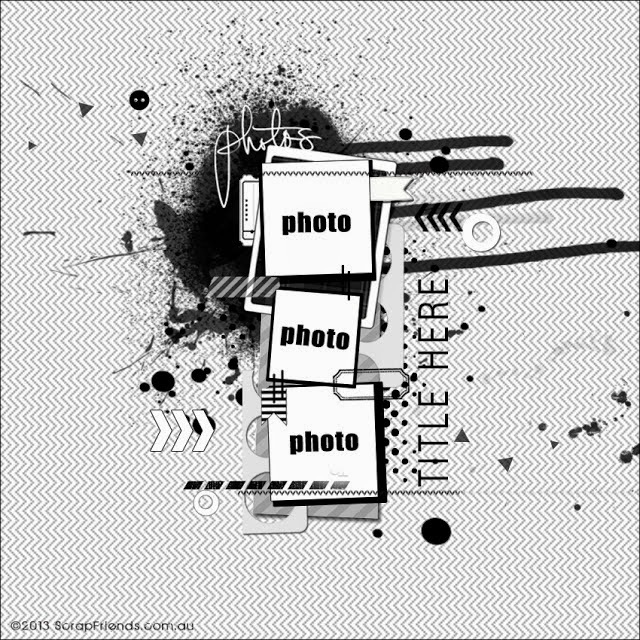 Great twist on the sketch for Sketchabilities, I love how you arranged the photos! Sweet page! Love the colors and how you altered the sketch to suit your page! Thanks for playing along w/sketch #101 at sketchabilities! Great page! Thanks for playing at 123 Get Scrappy! Love how you interpreted Sketch 101!! Such cute photos!! Thanks for playing along with Sketchabilities!! Such a fun layout! Thanks for joining us at 1-2-3 Get Scrappy! I always feel that scrapping is as much about the story as it is the photos and layout. Thanks so much for sharing! These are all wonderful! Thanks for joining us over at 123Get Scrappy. I hope to see you again! Beautiful layout!! Love the layering and background work!! Awesome story! Thanks for joining us at 123 Get Scrappy! !